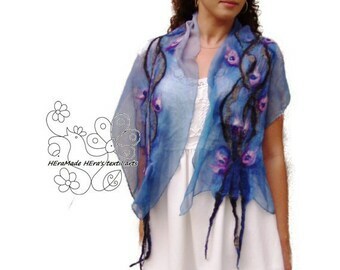 This is a pastel floral nuno felted scarf from luxury merino and pure silk for women who like feminine style. Perfect gift for your wife, sister, mother, daughter. CUSTOM ORDER. I will need 10 work days to prepare them for You. This is a photo about a sample piece which is already sold. The one that I will made for you is going to be really similar. But because of the technique that I use for this piece it is not possible to be completely the same, every piece is unique a little. It will be completely unique, you won't see wearing anything similar by anyone. In this photo you can see a 63x17,7inch scarf. The colors are vivid. Very unique piece! FANTASTIC seller! Great communication all the way from initial order to delivery. Shipped exactly on time and arrived quickly. And the scarf is stunning. Thank you very much for the excellent service. 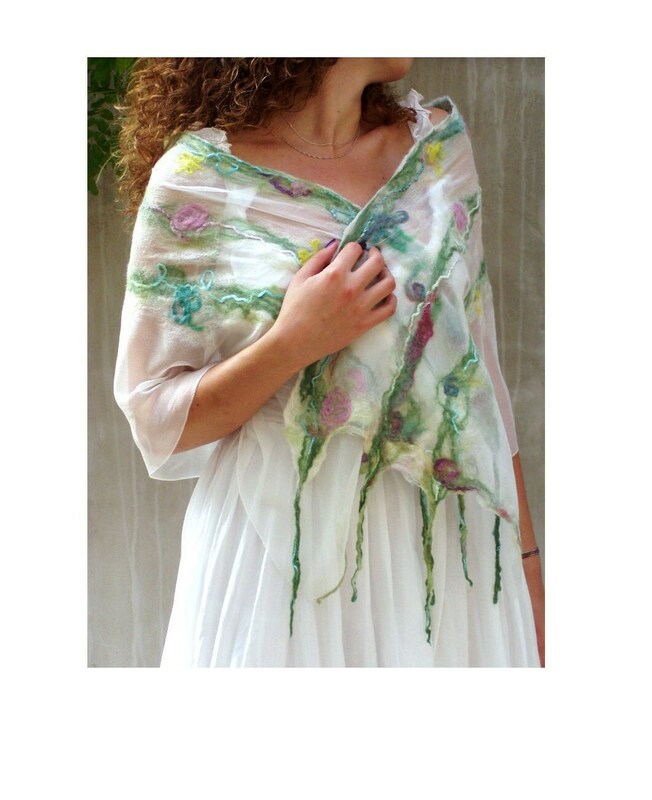 Soft, luxe silk with a melange of blue/greens that brighten any solid color top. Perfect size for a neckerchief. Thanks for a pleasant transaction. Although I have made every effort regarding colour correctness, please be aware that the item colour may differ slightly from those on screen. Care this work requires hand washing separately with mild silk detergent and flat or twist drying. It will get a little lighter after the first few washes, but not a lot. Just the unneccesary pigments are getting washed out from the filaments. Ready to ship items are shipped within 3-5 working days of the payment. Custom colour or made to request items usually will be shipped within 10-25 working days of the payment - it depends on yarn availability. Shipping options: normal shipping upgradeable to FedEx. I ship by Registered, Priority Mail to Everywhere. All Orders are shipped to the address provided on Etsy unless otherwise stated CHANGE To the USA the basic FedEx Economy shipping is 5workdays. For the shipping please give me your phone number! To other countries: normal shipping to Europe 5-10 workdays to other places 14-28 workdays. Economy FedEx shipping: 3-5 workdays No handling problems have ever occured, so I can strongly recommend Fedex as a shipping company. WARNING! The FedEx shipping is not an option to Russia, just for companies! ★The item which is not taken over won't be delivered back to me. It will be destroyed. The price of the item won't be payed back. The point of this painting technique that I work with is that I mix the colours, and I don't work with colours prepared in factories. I have some basic colours, then I mix them according to my imagination in order to get the wanted colours. I use paint brushes to add the colours on the material, which makes every piece special and unique. I always try to do my best and make exactly the same as on the pictures but many things can influence the colours. The lights when I paint the scarf, how the main colours are getting mixed during the painting process, how many time does it take to get dry after the painting, then at the end the steamer fixer also changes a little about the shades. The pieces seen on the pictures are samples. All customs/duty/VATs charges are a responsibility of the buyer. Sorry, we know they can be ridiculously high, but it's not up to us. We also cannot claim lower values than the item. Customs can delay packages ● Customs/duty/VATs charges does not apply in countries of the European Union. In other non-EU countries these cost are based on the laws of the actual country.